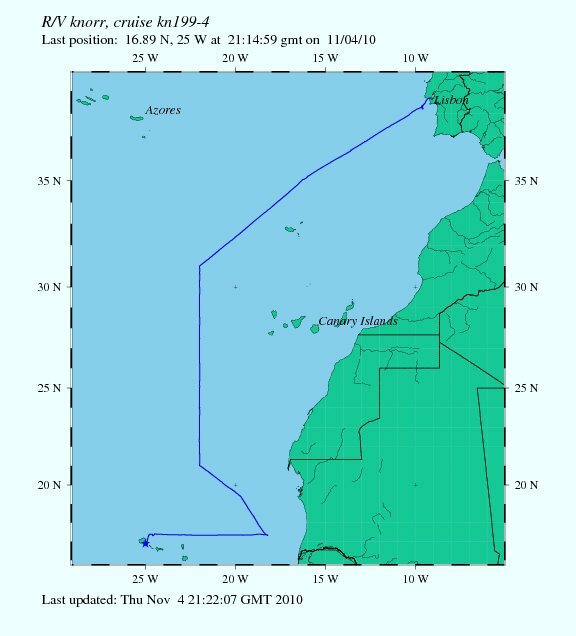 KN199-04 is the US GEOTRACES Zonal North Atlantic Survey Section cruise planned for late Fall 2010 from Lisboa, Portugal to Woods Hole, MA, USA. 4 November 2010 update: Due to engine failure, the scheduled science activities were canceled on 2 November 2010. On 4 November the R/V KNORR put in at Porto Grande, Cape Verde and is scheduled to depart November 8, under the direction of Acting Chief Scientist Oliver Wurl of Old Dominion University. The objective of this leg is to carry the vessel in transit to Charleston, SC while conducting science activities modified from the original plan. Planned scientific activities and operations area during this transit will be as follows: the ship's track will cross from the highly productive region off West Africa into the oligotrophic central subtropical gyre waters, then across the western boundary current (Gulf Stream), and into the productive coastal waters of North America. During this transit, underway surface sampling will be done using the towed fish for trace metals, nanomolar nutrients, and arsenic speciation. In addition, a port-side high volume pumping system will be used to acquire samples for radium isotopes. Finally, routine aerosol and rain sampling will be done for trace elements. This section will provide important information regarding atmospheric deposition, surface transport, and transformations of many trace elements. The vessel is scheduled to arrive at the port of Charleston, SC, on 26 November 2010. The original cruise was intended to be 55 days duration with arrival in Norfolk, VA on 5 December 2010. Science Objectives are to obtain state of the art trace metal and isotope measurements on a suite of samples taken on a mid-latitude zonal transect of the North Atlantic. In particular sampling will target the oxygen minimum zone extending off the west African coast near Mauritania, the TAG hydrothermal field, and the western boundary current system along Line W. In addition, the major biogeochemical provinces of the subtropical North Atlantic will be characterized. For additional information, please refer to the GEOTRACES program Web site (GEOTRACES.org) for overall program objectives and a summary of properties to be measured. Science Activities include seawater sampling via GoFLO and Niskin carousels, in situ pumping (and filtration), CTDO2 and transmissometer sensors, underway pumped sampling of surface waters, and collection of aerosols and rain. Hydrography, CTD and nutrient measurements will be supported by the Ocean Data Facility (J. Swift) at Scripps Institution of Oceanography and funded through NSF Facilities. They will be providing an additional CTD rosette system along with nephelometer and LADCP. A trace metal clean Go-Flo Rosette and winch will be provided by the group at Old Dominion University (G. Cutter) along with a towed underway pumping system. Cruise information and original data are available from the NSF R2R data catalog.